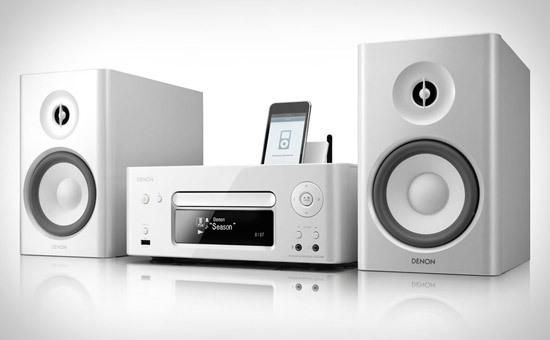 Denon N7: WiFi Network Streaming AM/FM Receiver With CD Player And iPod/iPhone Dock - iPhone.MY - Daily News On Mac, iPhone, iPads, iPods and more! Give your vintage speakers a passport to the future by hooking them into the Denon N7 Streaming Receiver ($480). This 65 Watt AM/FM/CD/iPod receiver features built-in Ethernet and Wi-Fi, giving you access to networked features like access to digital files stored on a PC or NAS, support for audio streaming from Pandora, Napster, or Rhapsody, support for remote control via the Denon remote app for iOS, and AirPlay support, making that iPod/iPhone dock on top just a wee bit redundant. Also pairs well with Denon’s SC-N7 Speakers ($135; pictured).